We had the opportunity to recently visit Zuoz, a quaint town in the Upper Engadine region of Switzerland, to watch our son play rugby against the international school. While we assumed that Zuoz was more of a winter village, what we found was a charming town alit with colorful buildings and unique architecture. We visited in fall over a balmy and clear weekend, and discovered that there are actually many activities even when it’s not snowing. There is a championship 18-hole golf course and myriad biking and hiking trails to take in the spectacular views, with mountains on either side. We chose to stay at the Hotel Castell because of its proximity to the fields where our son would be playing rugby. An added bonus was the wellness center. (With the tagline, “The fine art of relaxing” we figured we couldn’t go wrong!) When we arrived, we experienced an attractive hotel interior, with its variety of sculptures and artwork throughout, combined with the artistically landscaped grounds. It really made for an interesting cultural experience. Just my husband and I ! I booked the hotel through Booking.com fairly last minute. We got a room with a terrace view, which included breakfast and full use of the Hammam wellness for 320CHF per night. Hotel Castell is located up a narrow switchback road appropriately named Via Castell close to the base of one of the ski hills. It towers over the town and is easy to spot from far away. It offers parking on site (free outside, paid covered) and is about a 1.5 kilometer distance from the train station in town. We arrived early on Saturday morning and were luckily shown to our room right away. This gave us a chance to settle in and explore the hotel and its surroundings before driving back down to the rugby fields to watch the games. Our double Medium Panorama room was 30m2. We were on the second floor and enjoyed stunning views from all windows and the terrace It is worth noting that some rooms have been designed by St. Moritz architect Hans-Jörg Ruch, while other more urban rooms by UN Studio in Amsterdam (Ben van Berkel). Our room had a very comfy double bed (complete with two duvets), a modern chair, a coffee table, a desk area, and a bathroom with a tub/shower combo. We also loved the Bigelow toiletries that were provided, with a lush lime verbena scent. There was plenty of closet space where our two plush robes and slippers hung, beckoning us to visit the Hamam as soon as possible. While the main building is steeped in tradition and history, the hotel maintains a modern and clean aesthetic. In addition, the hotel’s owner has carefully curated the artwork that lines the halls, the open spaces and the hotel entrance. It really gave us the feeling of being in a boutique hotel. Breakfast was included in the room price and was served buffet style, in the dining room off the bar. Regional specialties, such as alpine cheeses, local sausages, marmalades and breads were offered among other breakfast staples. For our one evening in the hotel, we chose to eat in the bar/lounge area and were not disappointed. We chose a delicious quinoa curry and a Parma ham, ruccola focaccia sandwich from the bar menu h. Service was impeccable and welcoming, while the cocktails were well-made and wine prices within range for a five star hotel. The bar itself is cozy, with a lit fireplace in one corner which made for a more intimate space. There are also other spots in the lounge and around the bar that are more open and lively. Our one meal outside the hotel was on Saturday afternoon during a break in the rugby games. 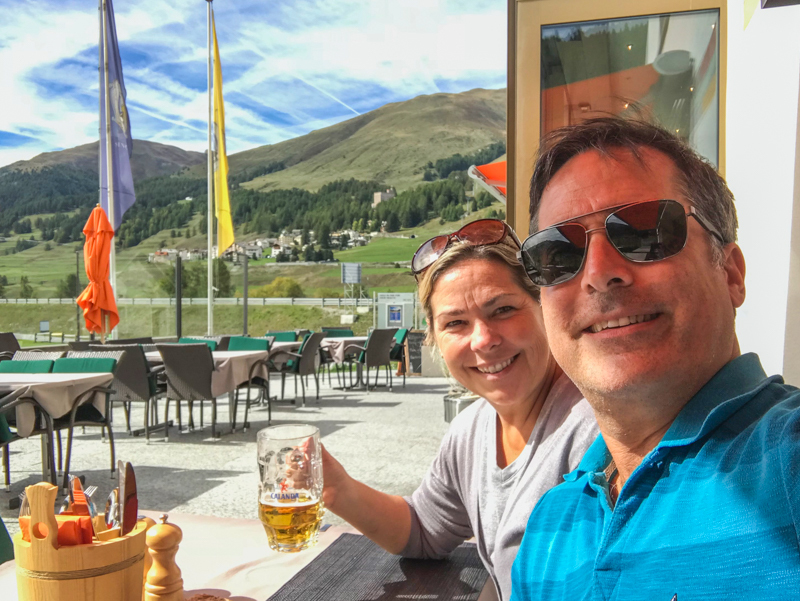 We walked across the pitch to enjoy outdoor seating at the Ristorant Sur En, which is connected to a sports complex, Center Sur En and the Engadine Golf Club-Anlage Zuoz-Madulain. My husband chose the recommended in-season dish of Hirsch (Venison) in a plum sauce and I went with the Cordon uBleu with crispy pommes. We shared a mixed house salad with homemade French dressing. Portions were hearty and I could only eat half of my meal. It did not go to waste, however as our son was happy to wolf it down straight after the tournament! For our cold beers, one glass of white wine and a very filling meal, we paid 100 CHF. The hotel was in a good location for exploring the nearby hiking trails, and Zuoz’ town center, and was within a short distance of the sports complex and golf course. Moreover, while we don’t have young children anymore, we saw several families enjoying the game room and talking about the family movie playing that evening. Others were happily playing outside in the wooden playhouse and a generous sand pit with a variety of toys. The hotel offers a KidsClub, many family activities and boasts something for everyone. We spent our Sunday after breakfast hiking and then relaxing in the well-designed Hamam before heading back to Zug. I can only imagine that winter activities are also plentiful, with two small family ski hills, as well as kilometers of cross country trails and a variety of family-friendly venues for ice skating, indoor swimming and bowling. The charming town is worth a stroll to appreciate the distinctive Engadine architecture, that has characteristic thick, stonewalls, smaller funnel shaped windows and sgraffiti (decorative etchings on the walls). It is said that the centuries old buildings were constructed to be all-in-one, where farmers could bring in the livestock, live with the family, keep warm and enjoy an interior courtyard. We took the Albula pass to get into Zuoz, driving through an otherworldly landscape above the tree line (2315m) and cutting through the opaque mist. The Albula pass closes from November to June due to adverse weather and avalanche conditions. For our return, we chose to take the Julien Pass (2284m) that connects the Engadin valley with the rest of Graubünden. This 40 kilometer section is also part of the Grand Tour Switzerland series of roads. We got to see beautiful St Moritz in passing, with sun shining down on the shimmering lake and impressive hotels and buildings rising up the mountain. . I would return. As a splurge or special occasion, it would be lovely to attend an art event at the hotel or experience one of the packages they have on offer, especially in the winter..
Getting there: Driving (2.5 hours without stops) is enjoyable and scenic in good weather, but taking a ride on the Bernina Express can be an exciting and unforgettable experience for the whole family. In the winter when the mountain passes are closed take the Vereina Car Train from Klosters- Selfranga to Sagliains.